I'm trying WordPress for a bit - visit ...aka darzy... there! Earlier this year, I was knitting many washcloths for a charity, and as I looked for patterns, I came across the Inflammable Hotpad which looked fun to make. A problem: I've never used the double knitting technique before. This technique allows you to knit the front and back of a piece at the same time. If you use one color yarn, you'll end up with a tube. Using two colors opens up a range of patterns where motifs pop due to contrasting colors. Since I wasn't confident trying a project with the free instructions and videos I found online, I signed up with Craftsy to take Foundations of Double Knitting with Lucy Neatby. 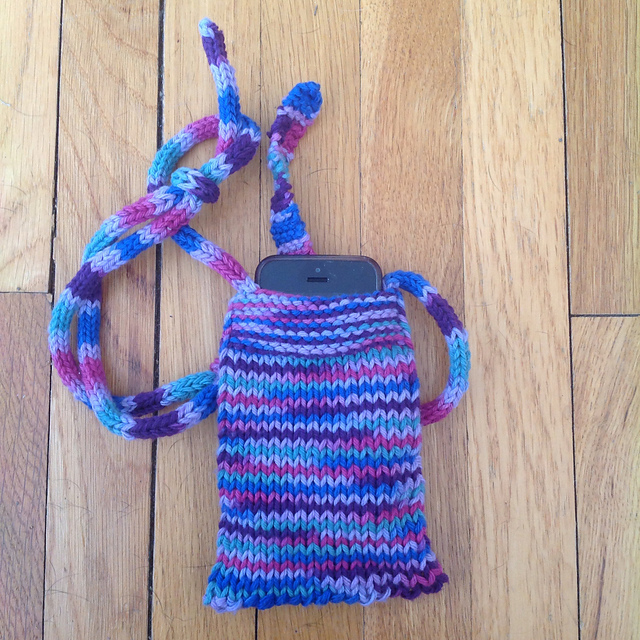 She provided clear instructions and helpful explanations, and after watching a few lessons, I knit one of the patterns that came with the course: the cell phone cozy. Having had such great preparation, I found completing this project was fun and easy. I still need to finish some of the lessons, though, and I haven't worked on the other projects because they just aren't to my taste. Craftsy classes don't expire, so in several months, if I need a refresher, I can return to the courses to review a technique. The classes I've previewed have had excellent production values with valuable material presented in an organized and intuitive sequence. Many of the topics are not usually covered by classes offered at local knitting stores, and they are ideal for people who are visual learners. Often, these national recognition days are established by industry groups promoting a product category. When I looked up the origin of National Donut Day, I was surprised to find that the day was first recognized in 1938 by the Salvation Army to commemorate the volunteers ("doughgirls") who distributed donuts to soldiers on the front lines (Fagan, 2009), although another source (Shanoon, 2014) refers to the volunteers as "donut lassies." One blog recounts a story in which a POW in Hanoi during the Vietnam War convinced his captors that the Marine Corps birthday was known as National Donut Day (Dolbow, 2009). The guards were moved to serve sticky buns to the prisoners during November 1968. National Donut Day or not, I love donuts. I remember them from quick stops at the E-Z Shop convenience store before school and as a treat on Saturday mornings after sleepovers with my best friend from sixth grade, Betsy R. When I lived in Oklahoma and had a long commute to work, I occasionally stoped for locally made treats. Since I became vegan, though, I haven't eaten donuts so much (which is perhaps a blessing). If I have the opportunity, though, I don't pass it by. I had a delicious vegan glazed donut at Rise Above in St. Catheriene's Ontario a few years ago. When a particular strong and unyielding craving struck about two years ago, I ordered a dozen through Vegan Essentials. Last summer, visiting Portland, Oregon, I nearly cried with joy to learn that the famous Voodoo Doughnut offered a wide variety of vegan pastries. (Why no bakery in Ithaca offers vegan donuts is a mystery to me. Another instance of ITH being overrated, though I digress.) Apparently, the bakery has been featured on a number of foodie shows and publications. Consequently, during the day, the line extended down the block and doubled back amounting to an hour or so wait. The line did not deter me. I ate nearly 300 it seems, so it's probably good that I was only there a week. The flavors I tried were as good if not better than non-vegan donuts. I can still smell the shop and taste the frosting! If I could teleport there right this minute, I would. They're right, the donuts are magic. Nom nom nom. Dolbow, Jim (2009, November). "Today is National Donut Day: A funny POW story." U.S. Naval Institute Blog (http://blog.usni.org/2009/11/10/today-is-national-donut-day-a-funny-pow-story). It's Aways Sunny in Philadelphia makes me laugh, hysterically, with snorting. When George and I first watched this season three episode, I could hardly hear Charlie's speech, I was guffawing so loudly. Current events have brought the scene back to mind. If it were only as easy as strapping on a job helmet and visiting jobland for jobbies. My second favorite scene about job searches comes from Seinfeld, season 2. George Costanza certainly could use a trip to jobland! (Can you believe this aired in 1991?) Whenever I think of jobs, I tend to have the same stumbling blocks as George. Oh, those jobbies. I love Pinterest! If you are on the site, please follow me! If I had two wishes for Pinterest, I would want to be able to pin pages without images using a customizable default image and to be able to group boards into collections. Alas, I do not work for Pinterest nor do I have programming skills. As of today, I have 118 boards with more than 9,000 pins. My boards are well-organized, and you can pick certain boards to follow or select "Follow All." Currently, my most pinned item is "Pit Bulls Are Just About the Nicest Dogs There Are." 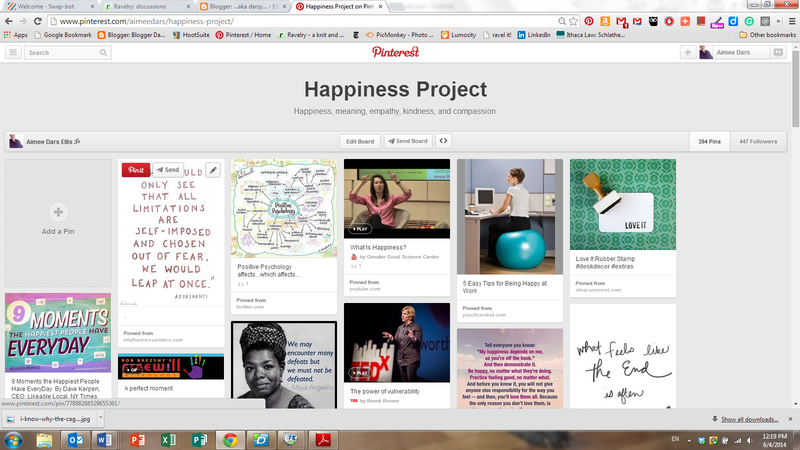 My favorite of my boards is "Happiness Project" with quotes, strategies, and images related to happiness, meaningfulness, compassion, empathy, and positive psychology. You can also search the millions of pins (over 30 million as of March 2014) for your personal interests. 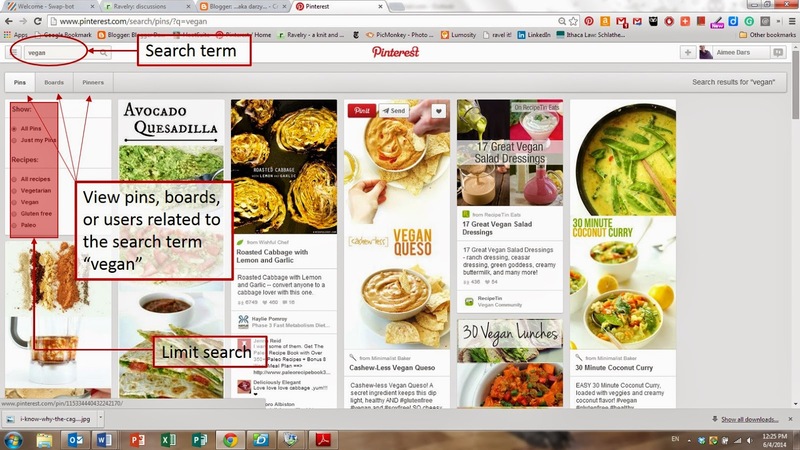 Once you've entered a search term, Pinterest gives you suggestions for limiting the search. You can also look for pins, boards, or pinners that include the search term as indicated in the figure below.